Log in and acquire Krasbit Recognition extension at www.adobeexchange.com site and follow with install via Creative Cloud desktop app. Creative cloud running at your computer should install extension automatically if connected to internet after a while. Restarting Creative Cloud and Photoshop or Illustrator should help to trigger sync with Adobe Exchange. If automated setup via Creative Cloud failed and new items are not available download and install .zxp extension manually via ZXPInstaller. See instructions under Download/Install another way link at ADOBE EXCHANGE. 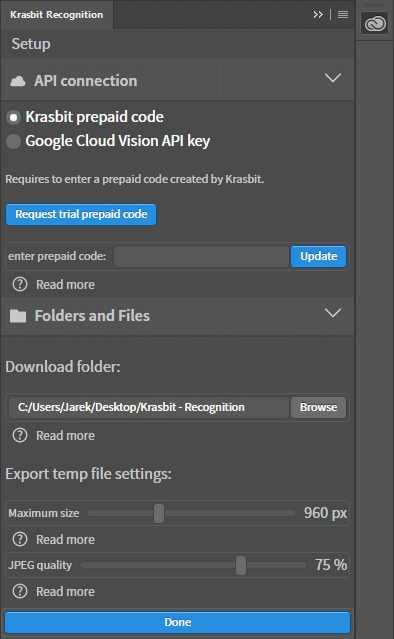 Click ”Use trial code” button at Krasbit Recognition setup window to automatically request and setup this code for free!